How It Works finds Daniel MacIvor in a mellow mood. Those used to the gruesome imagery and tortuous self-reflexiveness of his one-man shows like Here Lies Henry, Cul-de-sac or Monster may be perplexed with this relatively straightforward multi-character play, low on tension and aggression, that moves towards an unshocking conclusion. The play continues MacIvor’s preoccupation with storytelling as a form of healing, but we view it at work from outside, not inside, the distressed character’s mind. 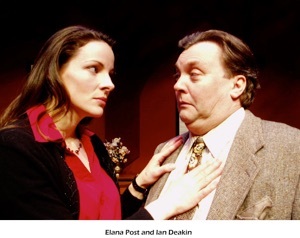 The simple story set in Halifax follows the developing relationship of Al (Tom Barnett) and Christine (Caroline Gillis) after Al’s divorce from Donna (Fiona Highet). The secret care that gnaws at both Al and Donna is that their 19-year-old daughter Brooke (Bethany Jillard) is addicted to drugs. The main surprise is that instead of being turned off by the situation, Christine is eager to help and knows exactly what needs to be done. Though there is an element of predictability to the underlying stories of both Christine and Brooke, what raises the play out of the ordinary is the clarity and almost classical restraint of MacIvor’s presentation that avoids any whiff of melodrama, his keen eye for the humour in everyday situations and the absolute believability of his characters and dialogue. Jillard, in her debut at the Tarragon, gives a breakout performance as the distressed character at the heart of the play. For once, we see a picture of how a real teenager speaks and acts, not yet another freakish automaton from film or television. She sublimely portrays the confusion of a young woman longing for the childhood she has left while deliberately numbing herself to the future. Gillis’s Christine is a wonderfully quirky character whose comically low-class tastes belie the real knowledge of life she has gained. Barnett accomplishes the difficult task of making a regular nice guy into an interesting character. Highet traces a detailed arc of Donna’s transition from forced frivolousness to genuine warmth. It would be foolish to criticize MacIvor for viewing the pain of living from a different perspective. In place of the thrills and chills of his earlier plays, How It Works is suffused with the glow of compassion. Note: A version of this review appeared in Eye Weekly 2007-11-15. Photo: Bethany Jillard. ©Cylla von Tiedemann.